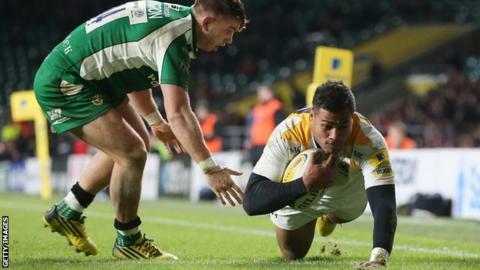 Wasps secured a bonus-point victory at Twickenham to consign London Irish to a fifth Premiership defeat of the season. Frank Halai's try helped Wasps to a 11-8 half-time lead, with Johnny Williams crossing in reply for the Exiles. Elliot Daly touched down to extend the lead to 21-8 after the break before Irish hit back through a second try from Williams, which was converted. But Wasps pulled away in the closing stages, with Thomas Young crossing and Halai grabbing his second score. Newcastle's draw at Sale earlier on Saturday means Irish slip to the bottom of the Premiership table. Wasps dominated possession and territory in the opening half but a hard-working defensive display from London Irish denied them a larger advantage at the break. Daly's try nine minutes into the second half then looked to have given Wasps control but Williams chased a kick through from Topsy Ojo to keep the Exiles within a converted score. However, two tries in the last 10 minutes reflected Wasps' overall dominance, and moves the Midlands outfit up to fourth in the Premiership table. "I thought it was a tough day for us. We lacked a lot of possession, but defended valiantly at various stages. "It's another tough loss, very frustrating. I walk into the changing room and see a very sad bunch of lads, who are desperate to get what they need to do in the competition which is to get some points. "I thought Wasps were controlled. At various times, I thought we had the wood on them. "But, we certainly played a lot of rugby in the wrong part of the field and failed to get the field position when it was important. "Some promising highlights were young Johnny Williams, I thought he was marvellous scoring a couple of tries. I thought our scrum was good at various stages and some of our counter-attack was good. "But, usually from long distance. So we need to be closer to the poles." London Irish: Ojo; Lewington, Tikoirotuma, Williams, Fowlie; Noakes, Steele; Court, Paice, Franks, Sheriff, Symons (capt), Trayfoot, Cowan, Treviranus. Replacements: Ellis, Smallbone, Halavatau, Sinclair, Narraway, Allinson, Brophy-Clews, Mulchrone. Wasps: Piutau; Tagicakibau, Daly, Jacobs, Halai; Jackson, Simpson; Mullan, Johnson, Cooper-Woolley, Gaskell, Myall, Haskell (capt), Young, Hughes. Replacements: Shervington, McIntyre, Cittadini, Davies, Jones, Robson, Gopperth, Macken.